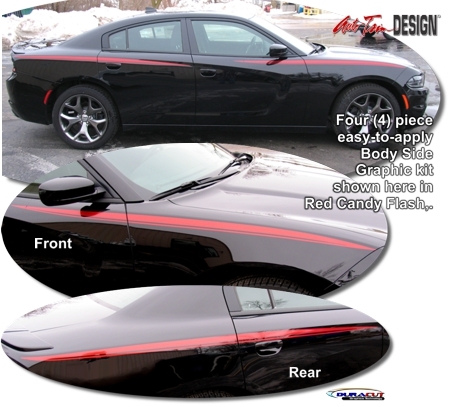 Dress up your '11-Current Dodge Charger with this simple and elegant four (4) piece Body Side Graphic kit. Available in a wide variety of colors, easy-to-install graphic features a classic pinstripe as shown, designed to flow with the Charger's unique body lines and is ready to apply (slight trimming required at Door Jambs). Graphic is designed to fit specifically on all '11-Current Dodge Charger front and rear areas as shown in the image. Please see Product Parts List for further application details.